Home » Posts Tagged "Odile Gilbert"
It was fairytale hair by the one and only Odile Gilbert at Rodarte’s Spring 2018 Haute Couture debut show in Paris. 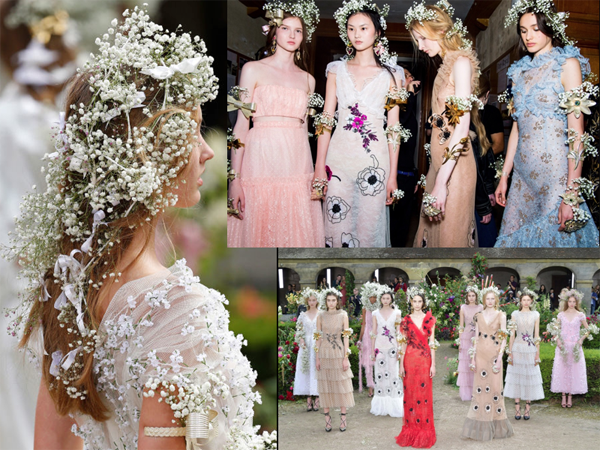 Baby’s Breath, floral crowns and wreaths adorned heads, shoulders, arms, cuffs, along with satin ribbons, Rodarte-designed metal bow/barrettes pinned into tendrils of hair, and other accessories. Fashion Designers extraordinaire, Laura and Kate Muleavy, wanted something magical for their first show in Paris, held in a 16th century cloister on the Left Bank. And Odile Gillbert along with Joseph Free, a L.A. Floral Designer, helped make magic happen. There were different hair designs on each of the 50 models, who wore ethereal divine dresses of tulle, chiffon, lace and leather. Photo Left: Getty Images (for style.nine.com.au) …. Photo Top Right: Jason Lloyd Evans (for vogue.com) … Photo Bottom Right: Giovanni Gianoni (for wwd.com) – with thanks to all. Seventh in a series featuring the talent in action working on photos in the Archives.